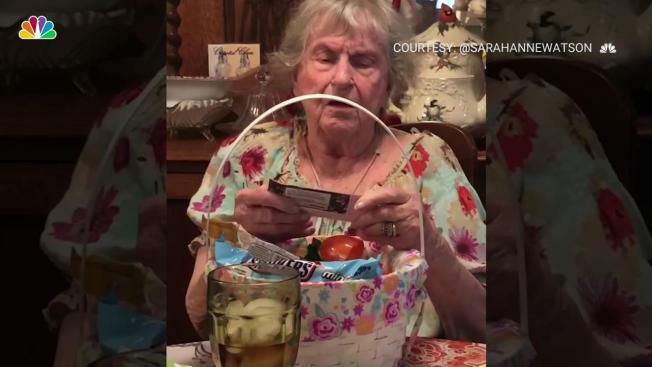 An 88-year-old grandmother just couldn't contain her excitement after her granddaughters surprised her with a ticket to see Justin Timberlake in concert. The adorable exchange was all captured on video by Bette Maloney's granddaughters Sarah Watson and Elizabeth Watson. The young women had tucked the surprise ticket in their "Nammie's" Easter basket. "Is this for real? For real, real?" Maloney says, fighting back tears. "I've been trying to figure out how to save money to go." Nammie is a huge Justin Timberlake fan, Sarah Watson told NBC affiliate WESH. “She loves him so much she thinks he (is) ‘just a really nice young man,’” she said. Her grandmother has loved Timberlake and his music since seeing him perform on Jimmy Fallon's talk show and "Saturday Night Live," and she told WESH that she's constantly finding Justin Timberlake-related searches left open on Nammie’s iPad. Nammie is excited that she'll be sitting closer to the stage at the May 14 show in Orlando, Florida, compared to their much higher seats at the "20/20 Tour" show.